The packet-switched architecture of LTE does not support circuit-switched voice calls as used in 2G/3G networks. Rollout of commercial LTE networks has been ongoing since the end of 2009 and a solution is needed to ensure fully interoperable and globally available voice services. Different approaches to support voice services in LTE have been discussed over the past years. 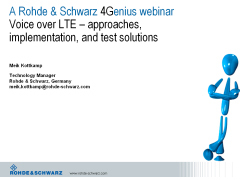 This webinar provides insights into relevant solutions such as simultaneous voice/data with two radios (SV LTE), voice over LTE (VoLTE) using IMS and circuit-switched fallback (CSFB) to existing 2G/3G technologies. It will explain available test solutions for verifying terminal behavior in the lab as well as in the field.